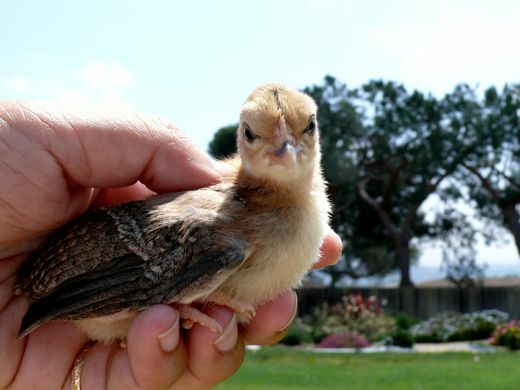 En Español, a chica is a little girl. 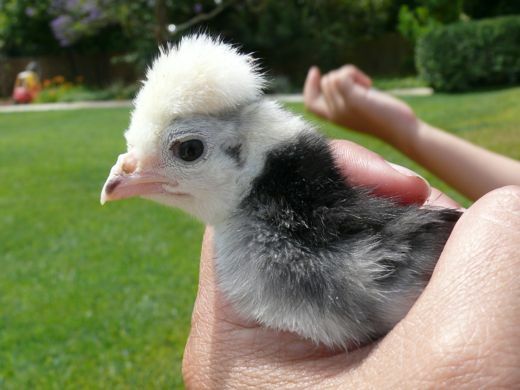 En Echickenblog a chica is a little girl hen. 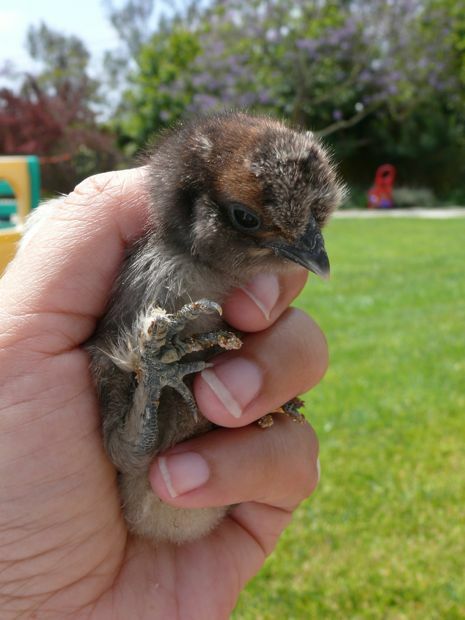 And this little girl hen is Temple. She is a Polish. She looks *ahem* funny now. She is going to look funnier elegant when she matures. Yes, Temple. You and your feathered hat are going to be show stoppers. And with your sister... oh my! Niki Tesla, how appropriate your shock of feathers are! I cannot help it, I do see a resemblance between the man and the chica. Trudy, it is you, right? 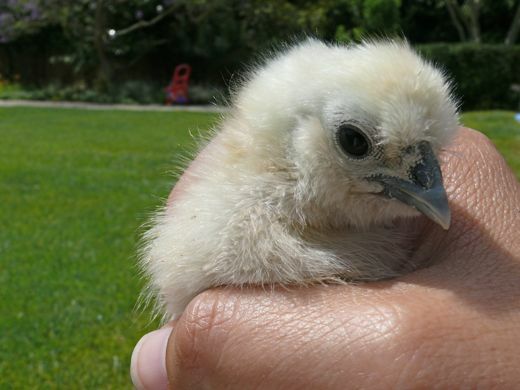 Slightly more yellow than her Silkie sister, Trudy is a feather footed fowl. We almost named her Suki... in honor of another pretty chica we know. 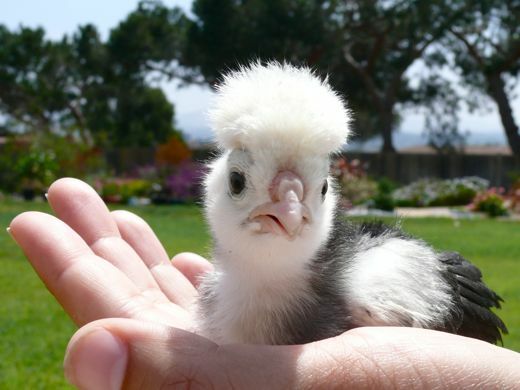 Of course one never knows whether everyone agrees that having a flighty feathered fowl named after them is an honor. Tiny, but spirited, Zoe. Zoe is our Araucana hen. Blue eggs and nesting, and heniness. Please. Oh, see? She is listening. 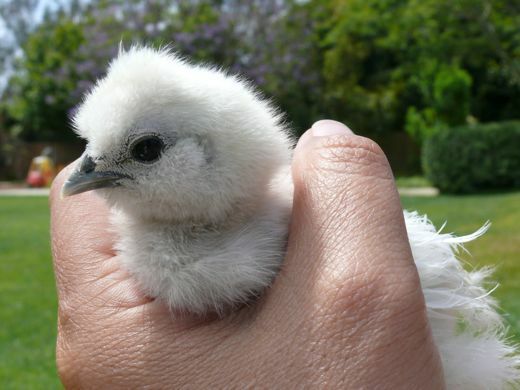 Zelda is the whiter Silkie chica. Max named her. The blue of her beak is becoming more apparent. 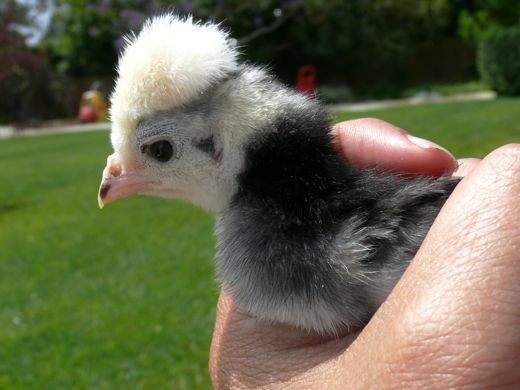 All of the chicas are bantams. They will out number Betty, but Betty will retain the size advantage. We'll see if it does her any good. When Maria named Puff, we thought it was cute. 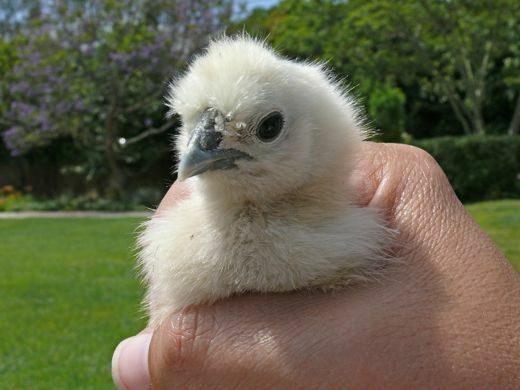 Now we are amused, because the name is cute and perfectly fitting for the tiniest puff of a chica. She doesn't even have signs of a tail, like her sisters. She is round. 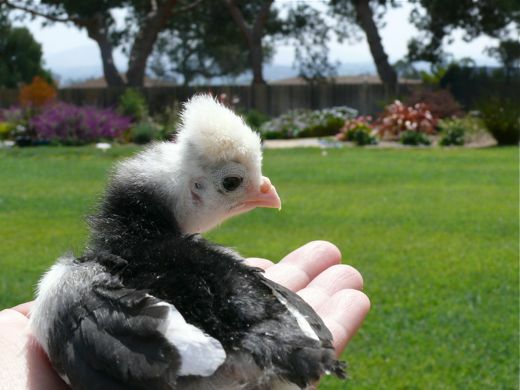 A black, Silkie Puff. 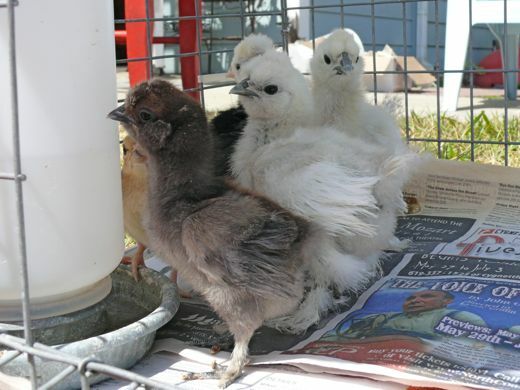 And like her Silkie sisters, I have to clean her feather feet. We like to handle the chicas at least once a day. We clean them and nuzzle them. 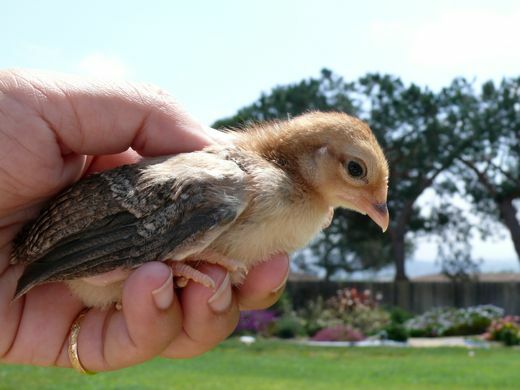 We scratch in the garden with them, and pretend we are mother hens. Gee... this is sounding obsessive and weird. I am obsessive and weird. Aaawwww!!! I want to hold them!!! They're so cute! And I LOVE their names! In fact, I love all of their names. I bet they're so soft and cuddly! I am definitely in the obsessive and weird camp with you, Natalie! Love your girls. 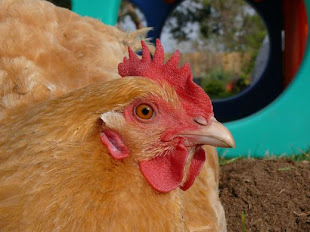 Now that my chica, Betsy, is gone, Buffy will be the sole bantam amongst a couple of Buff Orpingtons (Saturday!!!). 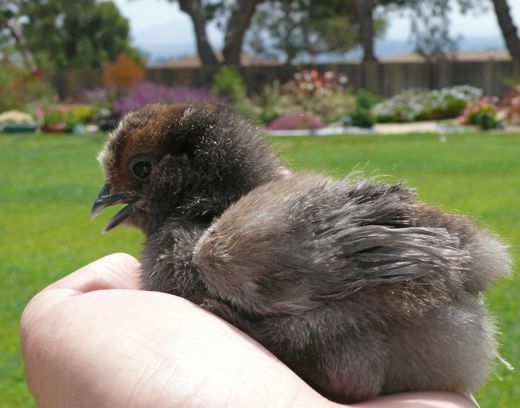 I would like more bantams but the supplier isn't going to get anymore in this season. I am hoping since they will view her as Mom, they will let her be top chica. I love the names your girls have. I hope Betty is doing well. Congratulations! Oohh, look at all those little birdies with their individual looks and their very people-like names! I love it! Love all your new little girls with the cute names! 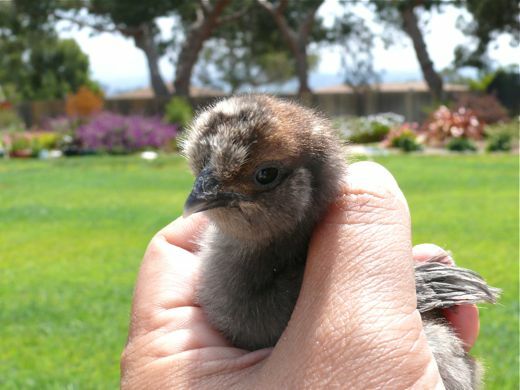 My Araucana, 1 of 2, lays green eggs. The prettiest mint green. The other, Cloud, is just finishing up a molt so I hope she starts laying soon. 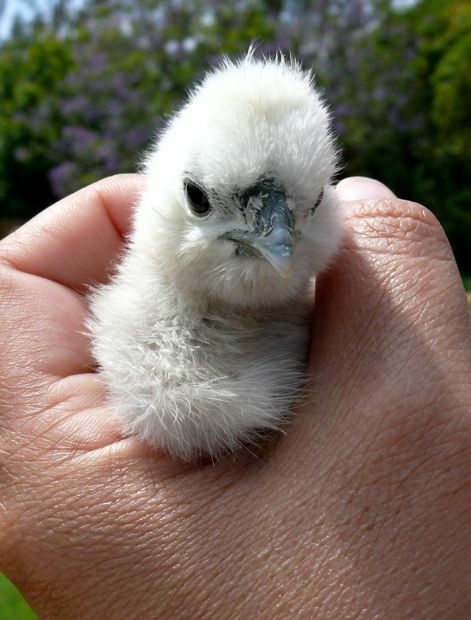 Amazing little creatures of fluff and feathers! I 'heart' Zoe. She is so sweet. I would chase her up and down the barnyard. Run, Zoe, run! I love to see your chica dreams coming true. They are adorable little creatures, and bringing you so much fun and pleasure. May we all be as obsessive and weird. I love the tuft on Temple's head. They're all cute! haha. they all look adorable. I've never seen a chicken "morning hair" before - Temple is awesome! Have you ever dealt with turkens?